This Galaga sampler blows my mind. Just looking at it, my palms get sweaty and I'm 7 years old, one quarter in hand, getting ready to wipe out in 1 minute. This sampler would be right up my alley as I'm 100% better at embroidery than I am at video games. Awesome work, Bex! You can see more of her creations in her shop. YES! This pattern seriously rocks. thanks for sharing it! This is such a great piece! The pixels are perfect, love it! 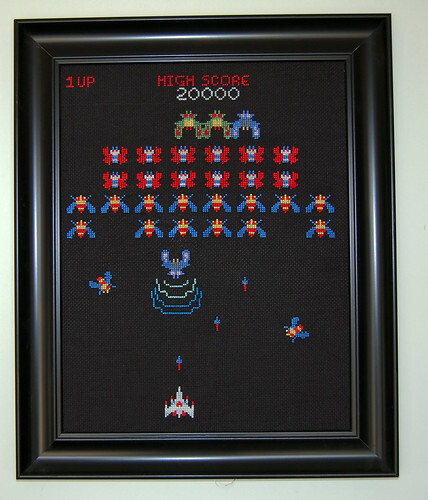 Oh my gosh, thank you for featuring my Galaga! Wow, doesn't that bring back memories?? I loved playing Galaga...I have to admit I was a lot older than 7 years old though! I know what you mean about the sweaty palms, there was plenty of palm wiping on the thighs of my jeans.